By gum, a mid week ride out, what’s that all about? With kids at school, the weather forecast predicting summer arriving and the two of us in dire need of a break, we booked a day off and hit the road. 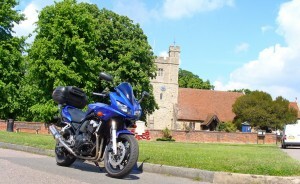 The plan was to hit the infamous Burnham Bends (around Burnham-on-Crouch), then double back, through Chelmsford and out to Bishops Stortford following the A1060. But wait, Mary was having a wardrobe malfunction: her old leather trousers were hideously baggy after recent dieting, but the interim pair bought cheap off ebay seemed to fit, but had no give in them and prevented her getting her leg over the bike. Not good. A quick pit stop at J&S Gants Hill sorted us out with a pair Frank Thomas trousers that fit and didn’t break the bank. Sorted. Now back on the road. The first chunk of the journey was dull dual carriageways on the A12 and Southend Arterial Rd. We hit quieter roads just past Wickford and cut up to South Woodham Ferrers and onto the more fun B1012. This twisty road leads all the way to Burnham-on-Crouch, whose approach is littered with sharp right hand bends, right, then left, again and again. Continue through Burnham-on-Crouch and out North towards Southminster and the onslaught of bends continues. Lots of fun, especially if you have some knee sliders looking a bit too new. But, do ride within your bounds, the bends can be tight, often blind, a couple of times I met oncoming lorries running wide as they came round the bends. Glad it was a right hander and I was positioned on the very nearside for maximum visibility. The area often has a high police presence too. We continued North to Bradwell to check out the Marina, but ultimately doubled back a little to the small village of Tillingham for our picnic. A very picturesque place (see photo above), with a decent pub and handy public loos. We ate on the village green and absorbed the tranquillity. Next we cut across through Brook Lane and on through Steeple (presumably imaginatively named such after the wooden steeple adorning the church in the centre of village. Around Latchingdon were took a right, up North towards Maldon, then onwards on the A414 to Chelmsford, going straight through and out on the A1060 (thankfully pretty well sign posted). The A414 is mostly fast dual carriageway and Chelmsford city centre is busy but soon negotiated. The A1060, a good twisty A road, which holds few surprises, but still entertaining. Most corners a fast and sweeping, but there’s a number of villages it passes through with more sedate speed restrictions. The A1060 goes all the way to Bishops Stortford, but if you like, hang a right in Leaden Roding and you can cut North to Finchingfield for more rural tight and twisty roads. A wrong turn, took us into Sawbridgeworth before we found Bishops Stortford, which turned out quite fortuitous. After riding round Bishops Stortford for a bit, we found the town centre pretty dull and so hankered back to Sawbridgeworth, which was smaller, quieter and less commercialised. A cafe pit stop here for teas and wees (and of course cake) provided welcome relief. But by now the clock was ticking on and the kids would soon need picking up from after school club, so back South to London we went, cutting past Harlow, but avoiding the M11 preferring a route through Epping and Theydon Bois. The first leg could probably be substituted with a better route through Brentwood, Hutton and Billericay, let me know if you find a good road here. Overall a good day out, couldn’t have asked for better weather. The bike handled well and Mary’s happy with her new leather trousers!